Okay, like most people, I love brownies and I love cookies. Put them together and what do you get? Perfection! 😀 I found this recipe in the King Arthur Flour Cookie Companion and I just had to try it. If you’ve never looked through any of their books or had a chance to peruse their website, you really should. They have some of the most amazing bakeware, sprinkles, chocolates and of course, recipes. I often don’t have time for recipes that are really involved. So, I am always happy when I discover a recipe that is both delicious and easy to prepare. These cookies fit the bill. The dough is super simple to put together when you melt the butter and chocolate (very carefully) in the microwave. Then, the rest of the ingredients are mixed in by hand. Easy peasy. 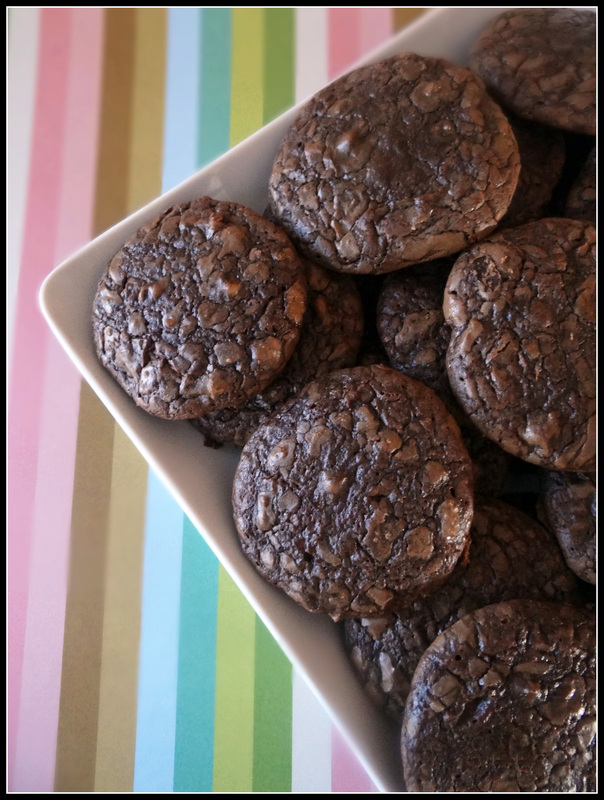 What you end up with is an intensely chocolatey cookie, with its chocolate flavor deepened by espresso powder. Please, don’t leave it out. 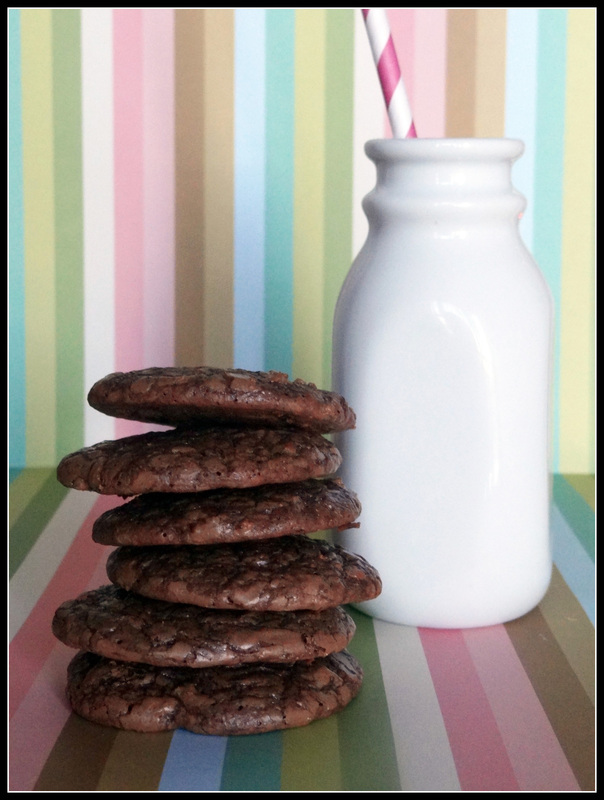 The cookie is super soft and gets a shiny, cracked top like the best brownies should. As if there wasn’t enough chocolate, I added mini chocolate chips for extra bursts of chocolate flavor. The cookie was delicious on its own, but then I decided to take King Arthur Flour’s advice and use them as the base of an ice cream sandwich. I put a big scoop of vanilla ice cream between two soft cookies and let me just say…..Genius! 😀 Whenever I make a recipe I ask my kids- thumbs down, middle, up or way up? This recipe got two thumbs way up infinity from Jack and Sammie, so this is a keeper for sure. Wait until they try it with ice cream! Hershey Kisses, nonpareils, or bittersweet chocolate wafers, if desired, to create a chocolate puddle. I did not do this…maybe next time. *You may use regular chocolate chips (1 1/3 cups = 8 ounces). If you’re using bar chocolate (as opposed to chips), chop it into small chunks. In a double boiler, or in the microwave, gently melt together the chocolate and butter. To avoid heating the chocolate too much and possibly burning it, the best method is to heat until the butter is melted and the chocolate has partially melted, then remove from the heat. Stir until all the chocolate melts. In a separate bowl, beat together the sugar and eggs until thoroughly combined. Add the hot melted chocolate (carefully as to not scramble the eggs), then stir in the remaining ingredients, including the chocolate chips, if you’re using them. Refrigerate the batter-like dough for 1 hour, to make it easier to handle. It firms up really nicely and is then scoopable. Preheat the oven to 325°F. Lightly grease (or line with parchment) two baking sheets. Drop the cookie dough by tablespoonfuls (about the size of a small ping pong ball) onto the prepared baking sheets. A tablespoon cookie scoop makes this easy. Leave about 2″ between the dough balls, as they’ll spread as they bake. Bake the cookies for 10 to 12 minutes, until their tops are shiny and cracked. They won’t crack until the very end, so keep a close eye on them; when they’re cracked all the way across the top surface, they’re just about done. The point is, you want these baked all the way through, but just barely. Additional baking will make them crisp rather than chewy- and you know how I feel about crisp cookies :D. Remove the cookies from the oven and top each with a kiss-shaped chocolate, a nonpareil, or a bittersweet chocolate wafer, if desired. Wait 5 minutes, then transfer them to a rack to cool. They are very delicate right out of the oven- make sure to let them cool. Smaller cookies? Drop the dough in 1″ balls onto the baking sheets (a teaspoon cookie scoop), leaving 2″ between them. Bake for 9- 11 minutes.